You want explosive, adrenaline-pumped action this summer? Forget all those big blockbusters, and look no further than "The Hurt Locker." Director Kathryn Bigelow has come up with a revelation of a film, one that not only conveys the surface rush of an action sequence but also gets into the minds of the people amidst the trauma of the action. Here's a female director who doesn't feel at all disadvantaged dealing with such masculine material. It's war she's dealing with, and not just any war; this is the war in Iraq, a topic that Hollywood efforts for the most part have failed in properly engaging. While there have been some exceptions, such as "In the Valley of Elah," the key to "The Hurt Locker" being a stand-out feature is the action-driven focus that makes this an Iraq war movie that people actually want to see. There is no biased preaching, and no political ideologies or agendas. The war is presented as it is, blunt and forceful. It's the first movie on the subject to feel like it has an objective postwar perspective. It's simply about what it was like, and most importantly, what it did to those within the chaos. Bigelow uses handheld cameras not to disorient viewers, but rather to set viewers right alongside the characters in the heat of Baghdad. While the camera work is subtle, it ultimately creates a great effect in getting viewers immediately into a state of uninterrupted attention and total absorption right from the opening sequence. Sgt. Matt Thompson (Guy Pearce) must neutralize a bomb, and we feel right there with him and his fellow squad members who stand guard. There's also a sense of humanity set up in this sequence that flows through the rest of the film. Defusing bombs is simply a job, and they treat it as such, as something that just has to be done. And in doing so, Thompson has a charm to him as he goes about his work, even though this is work that could easily kill him with one false move. This humanity roots itself in the screenplay by Mark Boal who derived it from his reports during the time he was embedded with an Army bomb squad in Baghdad. The hero of the film is Staff Sgt. William James (Jeremy Renner). And yet he's no action hero and just a man doing his job just like Thompson was, except that man got killed. He's like a surgeon, a professional when it comes to dismantling bombs as he knows his way inside and out of one and could even tell you something about the person who put the bomb together. He is an average man, one of no superior strength or knowledge; he just discovered he was really good at something thanks to the war in Iraq. He's a man who thrives on the rush of fear and gets more comfortable and content the more dangerous things get. In a scene where he must diffuse a car bomb, he's like an artist at work losing track of all else around him until his task at hand is done to perfection. Some soldiers are astounded by James while others are appalled because he loves taking risks for the sake of taking them. Played flawlessly by Jeremy Renner, this is an unforgettable performance that is worthy of Oscar nomination. 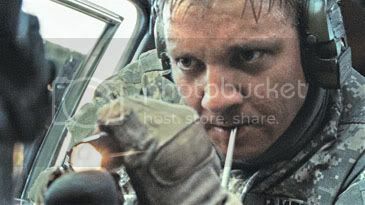 He shows James as a man who has been taken in by the drug of war, and he uses his character as the film's vehicle in stating that war is an addiction. This is a prime example of how men find themselves never able to give it up not because they have to but because it what makes them feel alive. The film opens with a quote from Chris Hedges, a former war correspondent for the New York Times, which states "war is a drug." Contrasting against James' impulsive behavior are Sgt. Sanborn (Anthony Mackie) and Spc. Eldridge (Brian Geraghty). Sanborn is a safe professional who is practical and goes by the book. He only wants to be careful, and therefore James gets on his nerves with his reckless tendencies. Eldridge is a good guy who holds fears and just wants to make it home in one piece. These three men have their differences, and they clash and grow together throughout their increasingly dangerous missions. Anthony Mackie and Brian Geraghty give equally powerful performances, and they exemplify James as unclassifiable. In one of the film's best sequences, the group comes across another team stranded with a flat tire led by a man played by Ralph Fiennes. The tension rises as dead bodies start to pile up, the sand becomes nauseatingly hot, dehydration starts to kick in, and blood needs to be cleaned off the ammo. A different side to James comes through here, a touch of tenderness as he coaches Eldridge through his fit of panic. This is an exhausting 130 minutes that is essentially a string of about seven almost unbearably suspenseful sequences with only small pauses in between each. It gets inside you and catches you in a vice grip that refuses to let go, and there are moments where you'll have to remind yourself to stop clutching your armrest and to continue breathing. In the end, however, it really is about the human aspect of war. This is suspense that matters, suspense that feels real and has weight and consequence to it, which makes it all the more monstrously nerve-racking. The title of the movie comes from the box of bomb pieces James keeps under his bed, pieces of the things that nearly took his life. "The Hurt Locker" has the feel of a classic, a film that deserves to be remembered and studied later, and it better be because we're looking at the front-runner contender for the Academy Awards.